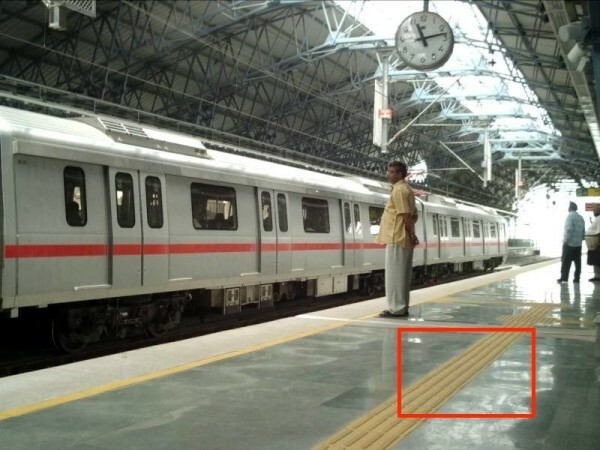 If you have traveled in Delhi Metro, you must have noticed a yellow pavement with raised oblong lines (see the image below) at the Metro station. The last time when I was at the Metro Station, I heard an announcement asking people to stay away from the central yellow line. That made me wonder if there is more to it than meets the eye. I did some research on the net and what I found is quite interesting! This yellow pavement is called Tactile Paving or Guiding Tiles and are used at stations, airports, sidewalks etc. to guide or warn the visually impaired pedestrians. The one that you see in the picture above serves as a pathway for the blind and disabled people. They are located midway on the platform, and lead directly to the lift, and then to the exit. 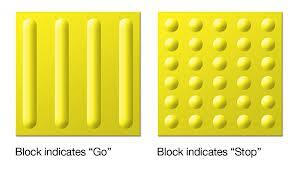 There are two types of patterns used in these blocks- the oblong raised pattern indicate places, and in what direction, it is safe to walk confidently. The “warning” blocks with the round raised dots indicate edges, corners or other places where greater care or caution is required. So, these tactile cues help everyone stay clear of train platform edges, crosswalk dropoffs, and other related hazzards. 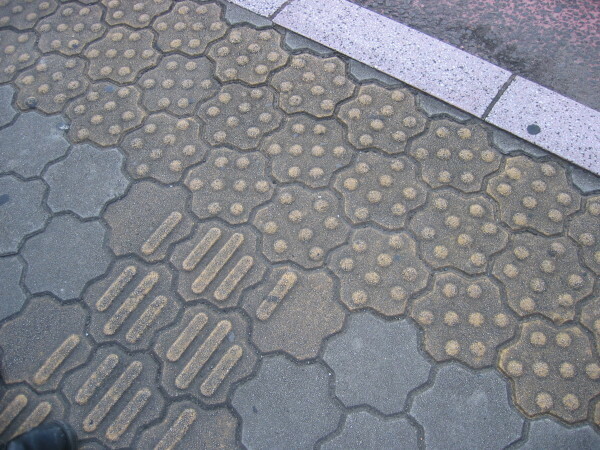 The original tactile paving was developed by Seiichi Miyake in 1965. The paving was first introduced in a street in Okayama city, Japan, in 1967. Its use gradually spread in Japan and then around the world and has now become a standard. The color is chosen in a way that it contrasts visually with adjacent walking surfaces, either light-on-dark, or dark-on-light. Here is an example from the internet which shows both the “safe” and the “warning” tactile paving together. Brilliant piece of information!!! Never thought of it’s purpose before, but very glad to know about it. really great info and great mind behind it. we have to pass this information to all citizens in india.